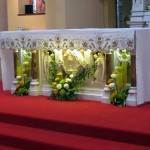 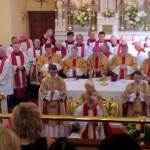 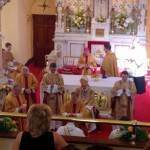 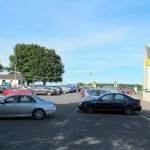 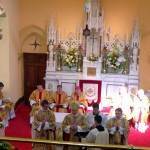 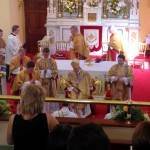 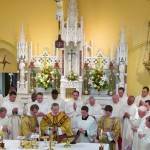 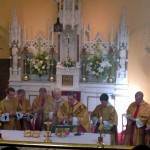 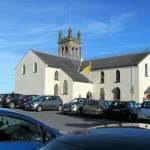 Rev Dominic McGrattan was ordained to the Priesthood by Bishop Noel Treanor on Sunday 29th June 2014, the feast of Saints Peter and Paul, in St Patrick’s Church, Portaferry. 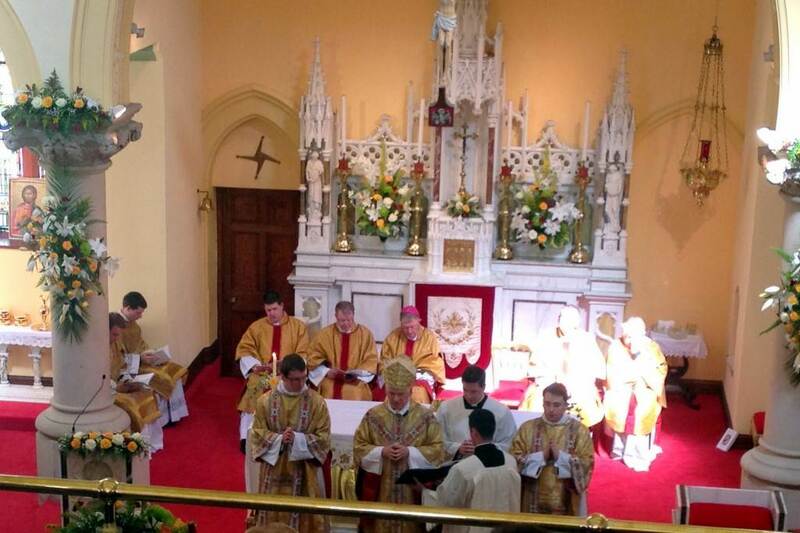 Priests and Diocesan Students from across the Diocese and neighbouring Dioceses, including our own Fr Neeson, joined parishioners from the parishes of Portaferry, Ballygalget and Ardkeen for this wonderful occasion and celebration. 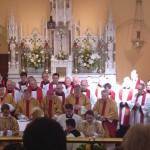 A visiting bishop from Australia also joined the ceremony. 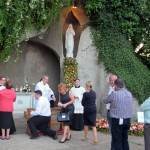 The following evening, 30th June, Father Dominic celebrated his first Mass and afterwards imparted his first blessing to all those who attended in the nearby Lourdes Grotto. 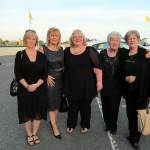 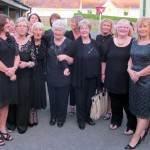 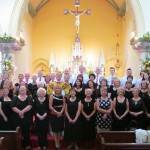 Members of Ballycran and Nunsquarter Choirs joined forces with choir members from Ballygalget and Portaferry to form ‘The Ordination Choir’ to sing at both ceremonies led by Mary Gallagher and accompanied by Ruari Donaldson. 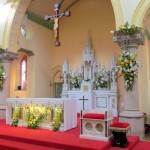 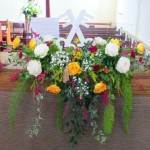 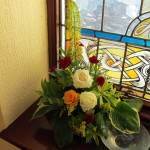 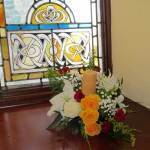 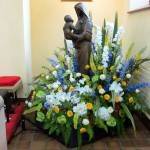 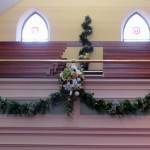 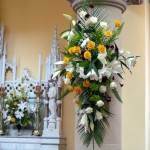 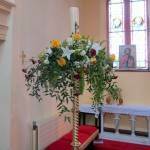 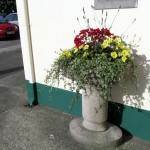 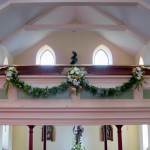 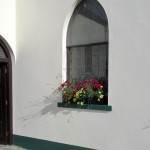 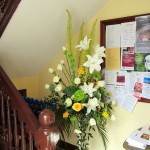 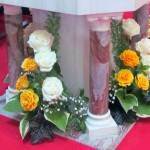 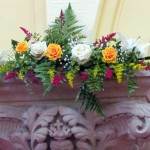 The Church, both inside and out, was colourfully decorated with wonderful floral arrangements. 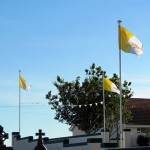 The Church grounds, and indeed the town itself, were awash with the Papal colours in the form of flags and bunting to celebrate the occasion. 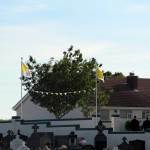 Refreshments were served in St Mary’s Primary School following both ceremonies. 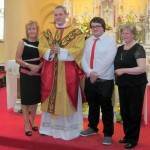 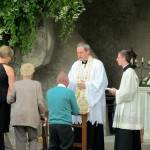 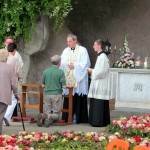 Many congratulations to Fr Dominic from the Parishioners of Ardkeen. 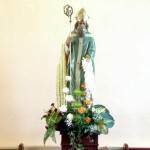 Lord, send forth upon him the Holy Spirit, that he may be strengthened by the gift of your sevenfold grace to carry out faithfully the work of the ministry. 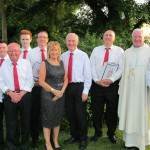 Sincere thanks to those members of our Parish Choirs who joined ‘The Ordination Choir’ for all their hard work over the past six months and to the youth from our Parish, who are part of the Pastoral Area Youth Team, who provided support at the ceremonies!